Let me come right to the point. This has been one of the weirdest winters that I can remember, and as I turned sixty in September, I can remember quite a few of them. At the end of December and creeping into January, the temperature dipped to twenty below zero, and barely budged above zero all day. Mainers are used to cold spells in the winter, but never for that long, usually only for a few days rather than for two weeks. Then, in mid-January, the temperature spiked to nearly fifty degrees, and we had lashing rain, the kind we usually see in summer or fall but never in the winter. As the saying goes, it’s an ill wind that blows no good, and the rain and warm weather did remove all the snow and ice from our roof. We were grateful for this as too much ice on a roof inevitable leads to leaks. However, on the bad side of the ledger, the rain and the spike in temperature caused rivers to thaw and flood. In central Maine, where I live, the closest river is the Kennebec, and it’s about ten miles from us, flowing through the nearby cities of Augusta and Hallowell and the small town of Farmingdale. The Kennebec is a storied river that played a role in the Revolutionary War and was a major waterway before the advent of automobiles. Businesses were flooded, and residents who parked in lots by the river lost their cars. On Tuesday (January 16) Clif and I had errands to do in Augusta, and we decided to drive into Hallowell to see what the Kennebec looked like. The flooded cars had all been removed, but there were ice chunks aplenty, something we don’t normally see this time of year. This is a rather long preamble for my Five for Friday. For readers who live in a warmer climate, none of the pictures would make any sense without an introduction. As this post indicates, there should be no doubt that climate change is real, and it is here. 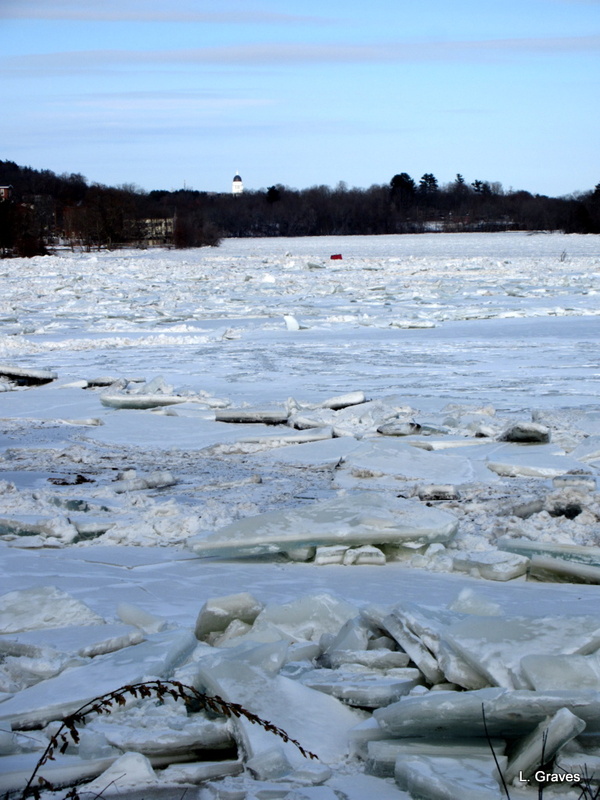 The flooding river in January is but one change this aging Mainer has seen in her lifetime. Here is a sign at a turnout between Hallowell and Farmingdale. 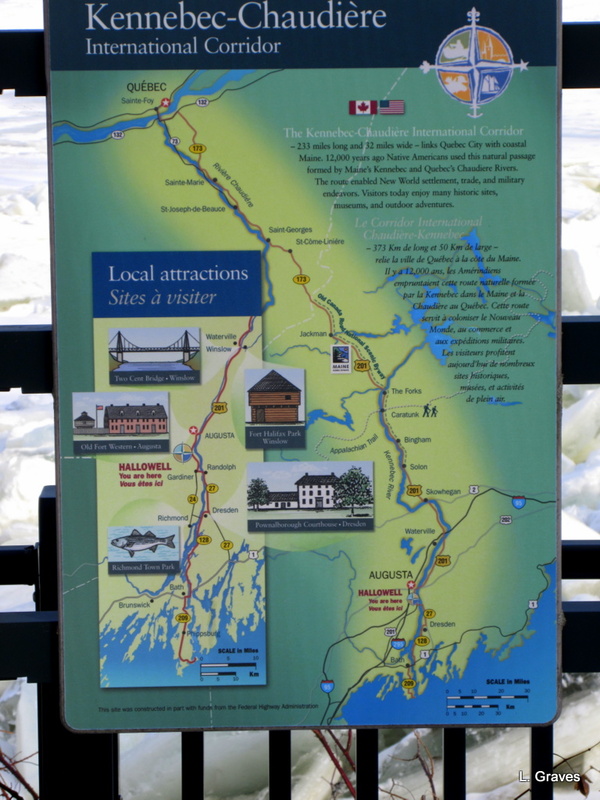 The Kennebec River is the waterway that starts on the right about halfway down the sign and heads directly to the ocean at the bottom. To get a better view, click on the picture. This is an upriver view of the river heading toward Augusta, the state’s capital city. If you look closely, you can see the white dome of the state house complex. It’s center left along the skyline. A smelt shack, carried by the ice from the edge of the river to the middle. 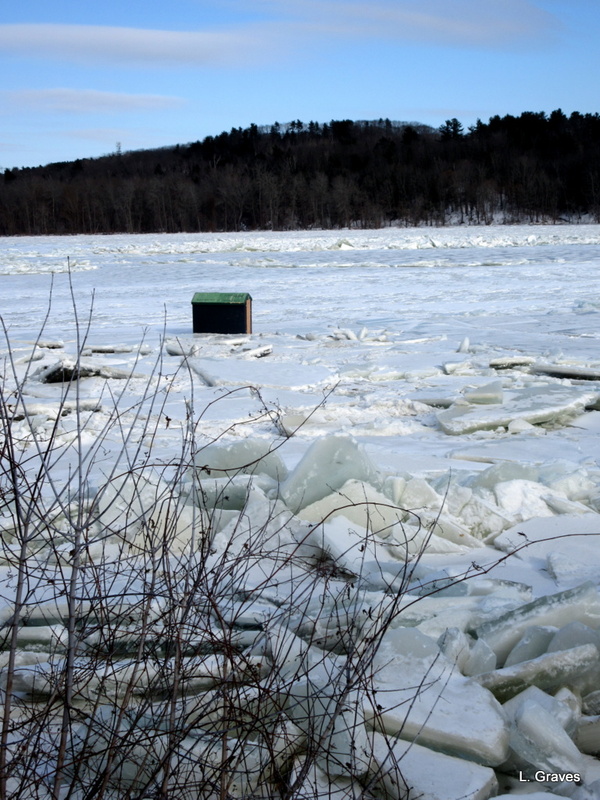 Unlike those who ice fish on lakes, people who ice fish on the Kennebec set up their shacks on the edge of the river, where the ice is thickest and therefore usually safe. 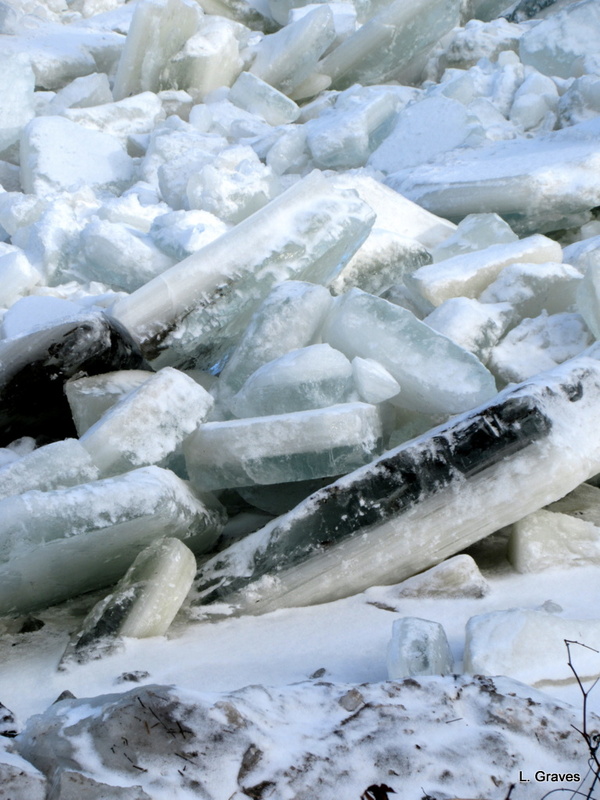 A close up of ice chunks. 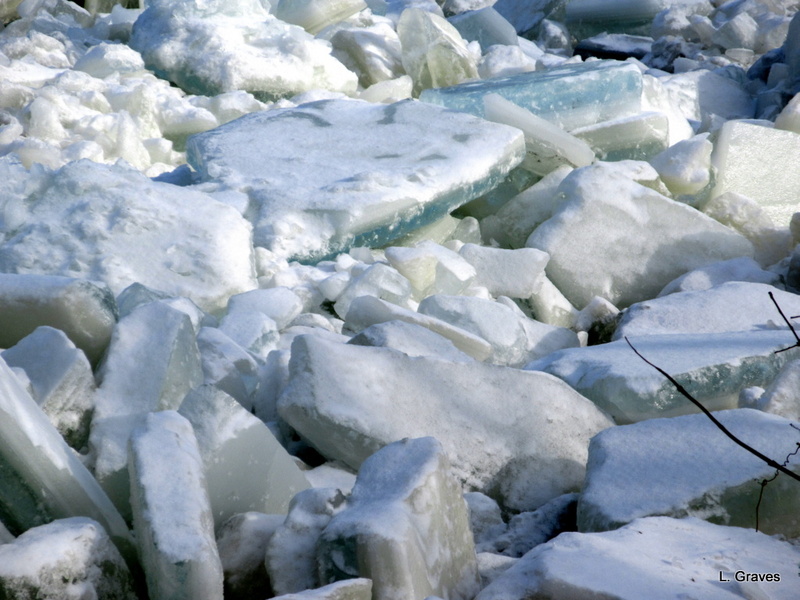 More ice chunks. With their Arctic look, I find them fascinating. Many thanks! Fortunately, we live far enough away from the river so that we are in no danger. You did a nice job of explaining and depicting what is happening. I particularly like the ice crystals pictures. I’ve never see it like this. It’s been a crazy winter no doubt! We went for those same weeks with temperatures below freezing – which doesn’t compare to Maine’s negative temperatures but is so not normal for NC. But then we’ve had multiple days up in the 60s and 70s after that. We’ve had two snow storms in three weeks, the first one about 2-3 inches but this last one was 12 inches of snow! and then by this weekend it will be in the 60s . . . Your winter has been as crazy as ours. The ice chunks are cool looking. I agree that the photos are good, although not of what we used to get when the seasons were more stable. I too am old enough to remember them, and to be delighted that around here near Woodstock NY at least the seasons feel pretty much like they did when I grew up in NJ and then spent a few decades in Vermont. In Maine, the seasons have been “off” for quite a few years. September is the new August. Fall lingers until December and then, wham!, winter hits with a vengeance. The new normal. Crazy weather for sure. More rain on the way, which ought to compound the ice jams already formed. I saw on the weather station that the Coast Guard sent an ice cutter up the CT river to break things up to try to prevent further flooding. The new normal?? What a climate, sorry about the flooding, bad at the best of times but surely worse in winter. The new normal, I think. A river rising eight feet in just minutes is scary no matter how you look at it. I hope the weekend warmth won’t cause more problems. You bet! That is frightfully fast. These ice chunks are fascinating for sure. It will be interesting to see how it plays out in the spring. More flooding is predicted in the next day or two. Our temperatures are going up for a few days, then rain early next week. I have been watching to see of the ice will melt first too. Great pictures, Laurie. I fear we humans, as a whole, are unable to forego our current wants in order to preserve ourselves in the long run. Jodie, you are so right. I include myself in giving in to too many wants. Any tips or suggestions? I know the problem is systematic, but each individual plays a part, too. I echo Jodie’s ‘great pictures’. May the weirdness subside. Thanks, Derrick. I fear it is the new normal. Our area had flash flooding from ice jams, too–it’s terrifying for the people who live near the rivers! The extremes this winter have been so unusual, and concerning . . .
Kerry you got that right! Many thanks! I know just what you mean. Glad you like learning about Maine! Surely this is irrefutable proof of climate change! I cannot see why certain people continue to refuse to accept this! Your photographs are excellent, especially of those ice chunks. Thanks, Clare. It’s disheartening that so many people in power deny that climate change is happening. History will not be kind to them. Eight feet in just a few minutes! Sounds terrifying. Sure does! Glad my car wasn’t by the river. Glad I wasn’t by the river, either. It is. Flooding is bad enough but flooding with freezing water is a lot worse. Climate change is real, alright. I wonder how some can still doubt it. I know. It’s beyond comprehension.